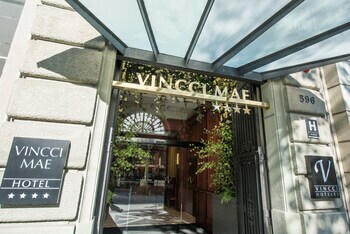 Located in Barcelona (Sarria-Sant Gervasi), Vincci Mae is within a 10-minute drive of Casa Batllo and Casa Mila. Featured amenities include dry cleaning/laundry services, a 24-hour front desk, and multilingual staff. When you stay at RealRent Vistabella in Almenara, you'll be on the beach and 13 minutes by car from Raco de Mar Beach. Free self parking is available onsite. Located in Alcudia, this villa is a 3-minute drive from Port d'Alcudia and 5 minutes from Roman Remains of Pollentia. With a stay at Rural Calaceite in Calaceite, you'll be in the historical district, just a 5-minute walk from San Antonio Arch and 7 minutes by foot from Calaceite Hill. Located in Sitges, Villa Teresa is a 2-minute drive from Garraf Natural Park and 6 minutes from la Caleta. Free self parking is available onsite. With a stay at this apartment in Empuriabrava, you'll be near the beach, within a 15-minute drive of Roses Beach and Butterfly Park Empuriabrava. Free self parking is available onsite.